"...Logitech announced a new line of mice called, with sufficient bravado, Revolution. Comprising a full-size home model, the MX, and a smaller (though still sizable) portable model, the VX, the Revolution line aims to, as the company so modestly put it, "transform the experience of finding and manipulating the vast amount of digital content on a person's computer or on the Web." "Now, I'm generally not one to get excited about input devices. Sure, after your CPU and display, they're the parts of your computer you use the most, and your choice of input devices can mean the difference between comfortable use and carpal tunnel syndrome, between productivity and plodding. But to actually be excited about a mouse? Let's just say it takes more than cleverly-worded PR-speak to get me raving. "But after using one of these mice, the VX, for several weeks - one of the perks of working at Macworld is that we often get review units before products hit store shelves - I'm nearly convinced...."
"The new Mac Pro desktop is a thing of beauty. Inside and out this box looks like it is the ultimate desktop computer on the market today. "With two, 64-bit, dual-core Intel Xeon 'Woodcrest' processors and it's sleek design, the Mac Pro is the computer equivalent of a Ferrari, Maserati or Porsche. And like a super sports car, you can pay a lot for the ultimate level of high-end performance." "Alain has taking photo of a Apple USB modem plugged into a MacBook Pro while being connected to the net. During a recall procedure trial, the modem simply started to melt less than 3 minutes of operation." "There have been a number of questions both here and on the forum about Mac Pro compatibility, so I wanted to be sure to address all of them ASAP. "1) Is Parallels Desktop compatible with the new Mac Pro tower? "Not yet. The new Mac Pros have a different CPU model, and work with a specifically optimized OS X kernel. It is not difficult to make Parallels compatible with either of these, but it does take a bit of time. We should have a compatible build very soon. "When I say very soon, I mean very soon. Like within the next few days. "3) How will we find out when the build is ready? "If you're signed up to receive Parallels news, you'll get an email from us with instructions on how and where to get the build. Not signed up? Just enter your email address on the main Parallels home page and you'll be good to go...."
PR: Logitech has announced a revolution in PC navigation with two advanced mice that transform the experience of finding and manipulating the vast amount of digital content on a person's computer or on the Web. Already an indispensable tool for PC navigation, the computer mouse can now meet the advanced demands of people who need to move quickly and intuitively through multiple Web pages, large spreadsheet files, digital photos, playlists or any of the other rich, abundant digital content available today. The Logitech MX Revolution cordless laser mouse and the Logitech VX Revolution cordless laser mouse for notebooks mark a radical change in navigating this content - from which few people will turn back once they have experienced it. Both mice feature hyper-fast scrolling with a revolutionary alloy wheel - the MicroGear Precision Scroll Wheel - that spins freely for up to seven seconds, spanning hundreds of pages with a single flick of the finger and setting a new benchmark in scrolling efficiency. Computer navigation with these mice is also enhanced with an innovative One-Touch Search feature that allows people to select a word or phrase on a Web page or in a document and, with a single click, view Internet search results on that subject. And with their ergonomic designs, the new mice offer a level of comfort that is almost forgettable - they become a nearly imperceptible extension of the hand. A recent Logitech study revealed that people, on average, have six applications open on their computer at any one time, and the active window switches or a new window opens every 50 seconds. To navigate the vast content at their disposal, people spin their mouse's scroll wheel approximately 26 feet in an eight-hour day. The MicroGear Precision Scroll Wheel helps ease this navigational challenge in two different ways. Its breakthrough free-spin mode takes people through long documents as quickly as they want. A single flick of the finger yields as many as 10,000 lines of a Microsoft Excel document in seven seconds - with a traditional scroll wheel, it would take 500 spins and seven minutes to cover the same territory. The new wheel also offers an improved click-to-click scrolling option that results in familiar tactile feedback for each small unit of distance scrolled, allowing people to precisely navigate lists, slides and individual images. "By giving people the option of using a free-spinning scroll wheel, Logitech has addressed a source of pain for computer users, who previously had to continuously move their index finger to scroll through long documents," said Ashish Arora, Logitech's vice president of product marketing for retail pointing devices. "Every application lends itself to different kinds of navigation - and with its sophisticated technology, the wheel can elegantly switch between the free-spin and click-to-click scrolling modes. People who try the new wheel say that they can't go back." Marking another breakthrough in navigation, the One-Touch Search feature can be married to a user's search application, such as Yahoo! or Google. When a word or phrase is highlighted in a document or on a Web page, a click of the One-Touch Search button, located just beneath the scroll wheel, automatically begins a search of the Web or computer system. Ergonomics has become increasingly important as people continue to spend more time immersed in their digital content. Sculpted contours on Logitech's new mice create natural resting points for fingers, and rubber thumb grips make it easy to grab and move the mice without squeezing too hard. Both mice feature low-resistance polytetrafluoroethylene feet, enabling them to glide smoothly across a surface with minimal exertion on the part of the user. And the MicroGear wheel includes an inset rubber belt that makes it easier for the index finger to grab and flick the finely tuned wheel. The world's most advanced mouse, the Logitech MX Revolution mouse includes an intelligent twist to the MicroGear Precision Scroll Wheel: The motorized wheel automatically switches between free-spin mode and click-to-click mode, with Logitech's SmartShift technology, based on the best setting for the application being used. In some applications, such as Microsoft Excel, Logitech's technology also senses the speed at which people spin the wheel - if spun rapidly, the wheel goes into free-spin mode; if spun slowly, the wheel shifts into click-to-click mode. People can also toggle manually between modes - by pushing down and clicking the wheel. And settings for the wheel and for all of the mouse's seven buttons can be customized for individual preferences within the included Logitech SetPoint software or with Logitech Control Center software for Mac, available via download. The MX Revolution also features a second wheel near the thumb that can either be used to zoom in and out of photos and documents, or to quickly switch between applications, furthering people's navigational efficiency. 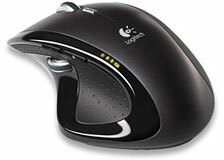 The Logitech MX Revolution mouse has a suggested retail price of $99.99. It is now available in the U.S. and in Europe. Designed for notebook PC users who want the very best in a mouse, the Logitech VX Revolution mouse balances portability and comfort. It's smaller in size than the MX Revolution mouse and includes a slot to store the 2.4 GHz micro-receiver, making it more portable. 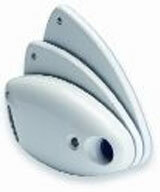 And its ergonomic design, rubber-lined thumb grip and slightly concave key plates make it highly comfortable to use. The base of the mouse features a switch that can shift the MicroGear Precision Scroll Wheel from free-spin mode to click-to-click mode. 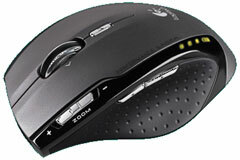 The mouse also includes a zoom slider that makes it easy to zoom in and out of open documents and photos. 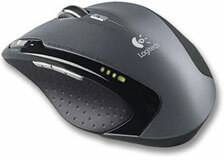 The Logitech VX Revolution mouse has a suggested retail price of $79.99. It is now available in the U.S. and in Europe. PR: Take your PowerMac up to 2.0 GHz. Achieve furious Mac acceleration in 20 minutes or less with easy to install MAXPower Processor Upgrades from Newer Technology Inc.! Engineered for high speed with Plug and Play technology, it is possible to effectively double or even triple the speed of an older Power Macintosh by adding a MAXPower G4 Upgrade from NewerTech. NewerTech MAXPower G4 upgrades dramatically improve Mac performance and restore the value of your investment. MAXPower Upgrades utilize higher speed Motorola/Freescale PowerPC G4 processors that are coupled with exclusive technology advancements and added cache capacity over standard original CPU. Advanced features are designed to make the NewerTech MAXPower G4 Upgrade the most stable and highest performing processor upgrade available on the market. Upgrades for PowerMac G4 AGP Graphics (Sawtooth), Gigabit Ethernet, Digital Audio, and Quicksilver models. System Software: Mac OS 9.2.2 or Mac OS X 10.3.5 and later, including all versions of Mac OS X 10.4 Tiger; Mac OS X 10.5 "Leopard" upon it's release. MAXPower Processor G4 7447A Upgrades for Macintosh G4 AGP-based PowerMacs. PR: Trans International has specially engineered the heat spreader (heat sink) for the fully - buffered DIMMs installed in the Mac Pro Quad Xeon which exceed JADEC standards and conform to Apple's stringent thermal, mechanical and electrical design specifications and guidelines. More cooling surface on these heat spreaders allow better heat dissipation, providing efficient cooling for the components. Cooler operation enhances memory performance. Mac Pro Memory Upgrade kits from 2 GB to 16 GB will be shipping from Monday, August 28th. 2 GB Kit (2 x 1 GB) is currently offered at $499. PR: The new Digiana iTube-201 combines a powerful FM Transmitter, Auto Charger, and Flexible Dock all into one device. Created specifically for the iPod (Video, 60 GB and 30 GB) and iPod nano, the iTube-201 lets you take your iPod on the road in style... its brilliant design, with a blue backlit display and blue LED pulsing light strip, integrates handsomely with your car's interior all the while streaming your iPod's music to your car's stereo speakers. The iTube-201's powerful FM transmitter delivers superb sound quality while its flexible iPod dock positions your iPod for safe and optimal access to its controls and display. 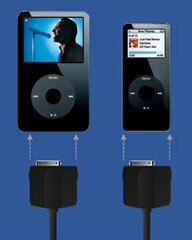 Finally, an iPod accessory that's as cool as your iPod. Get yours today for just $74.99. The AudiaX iTube-201 is the most functional and elegant FM Transmitter, Auto Charger, and Flexible Dock ever created for the iPod nano and iPod 5G (Video). Plugged firmly into your car's cigarette lighter socket (with the help of specially designed rubber gaskets built into the iTube-201's cigarette lighter adapter) and holding your iPod within easy reach atop its flexible neck dock, the iTube-201 transmits a clear, strong signal to your car's stereo system along any FM frequency between 88.1 MHz and 107.9 MHz that you choose... all the while powering and charging your iPod! Even metropolitan areas are no match for the iTube-201's strong, "radio-catching", signal. The iTube-201's elegant and functional design incorporates a flexible steel neck which allows your iPod to be positioned in your car at the most convenient and optimal location so you can safely reach your iPod's controls and see your iPod's display while behind the wheel. No more fumbling around for an iPod that has slipped down in between seats or that's been flying all over your car because there's no secure place to put it. Your iPod is safe, protected, and secure in the iTube-201's flexible neck dock. And because it sits atop a flexible neck, your iPod can also be positioned so that your PASSENGERS can watch videos (on the iPod 5G, Video) comfortably without having to hold the iPod in their hands... thereby becoming a portable entertainment system. Plugged into a rear seat cigarette lighter adapter means rear passengers can get it on the fun as well! And plugging headphones into the iPod's own headphone jack while it is connected to the iTube-201 will allow a car's passengers to listen to music or watch videos privately as the driver listens to his own music through the car stereo. All the while the iTube-201 is powering and charging the iPod meaning that the tunes and videos will never run out while you're on the road... and once you reach your final destination your iPod will be fully charged and ready to go! Controlling the iTube-201 couldn't be easier with its easy-to-read blue-backlit display showing what frequency it is currently set to. There is a "Frequency up" button and "Frequency down" button to change the frequency in 0.1 increments and a memory button in front for instantly tuning to one of the iTube-201's four programmable station presets. The iTube-201 will even turn off automatically and switch to "Charging-Only" mode after 60 seconds if the music from the iPod has paused or stopped. If you hit play on your iPod the iTube-201 will sense the audio signal and turn itself back on automatically as well! There is a blue light strip on the iTube-201 that pulses to the beat of your favorite music (which you can turn off if you prefer) and glows steadily when in "Charging-Only" mode. AudiaX iTube-201 compatible with iPod 5G (video) and iPod nano. (Also compatible with iPod mini). Full FM Frequency Range: 88.1 MHz to 107.9 MHz in 0.1 Increments. Conveniently Positions iPod within Easy Reach for Access and Viewing. Elegant, stylish, and ergonomic design. Blue Backlit LCD, Charging Indicator, Strobe Light Bar. Size 12.5" x 1.5" x 2"
...words that have been used by customers to describe the iTube-201. The amazing part is that aside from its bold looks, its performance is even better. The power and quality of the FM transmitter circuitry provokes everyone who hears it to tell us it is the strongest and clearest sounding FM transmitter they've ever laid ears on. The iTube-201 includes an integrated cigarette lighter adapter that powers the iTube-201's FM transmitter, charges your iPod and keeps it powered indefinitely. The Apple "Made for iPod" logo on the iTube-201 is your assurance that this product meets specific requirements and guidelines established by Apple for the proper manufacture of products for the iPod. PR: Better Energy Systems, a leading manufacturer of eco-mobility products, including the award-winning Solio, is set to charge the US having recently moved its headquarters to California. The decision to move is largely due to overwhelming demand for Solio and the huge potential for Better Energy Systems' upcoming range of innovative and environmentally aware products in the US market. Better Energy Systems' CEO, Chris Hornor, comments: "We are thrilled to be finally relocating our headquarters to the sunshine state of California. It is definitely the perfect time for us to reach the US public with our products. California is leading the charge in the take-up of environmental responsibility and we aim to meet the demand for cool and practical eco-mobility products." Better Energy Systems is a leading producer of products that seek to balance the environmental ideals and design aesthetics sought after by the modern consumer. Solio which won the prestigious 'Best of Show' Award at its launch in the 2005 Macworld Expo, has been a resounding success around the world and has enabled Better Energy to demonstrate that efficient, well-designed and environmentally aware products can be a commercial success. A one of a kind pioneering concept in eco-mobility, the hybrid nature of Solio comes from being able to plug it into the wall for charging at night or on cloudy days. It fits comfortably into a pocket, making it a perfect power solution whether for your daily commute or adventure into the wild. Not only practical but also a high fashion item, Solio is designed to do its job wherever you are, whenever you need it and what's more, it looks great!